For courses in international business, international management, and general management. International Business is conducted around the globe across cultures, languages, traditions, and a range of economic, political, and technological landscapes. 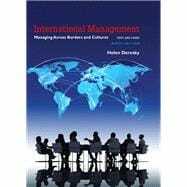 International Management: Managing Across Borders and Cultures examines the challenges to the manager’s role associated with adaptive leadership and thoroughly prepares readers for the complicated yet fascinating discipline of international and global management. No matter the size, companies operating overseas are faced with distinct scenarios. In order to be successful, they must accurately assess the components that shape their strategies, operations and overall function. The Ninth Edition trains readers and practicing managers for careers in this evolving global environment by exposing them to effective strategic, interpersonal, and organizational skills, while focusing on sustainability.